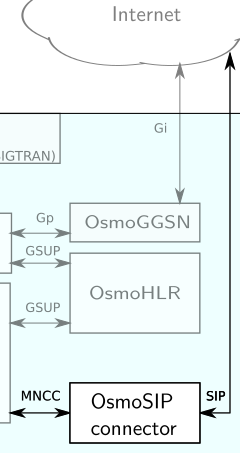 The OsmoSIP connector is the modern gateway between the MNCC Interface of OsmoMSC and an external SIP trunk. It converts between GSM TS 44.007 MNCC primitives on the one hand side and SIP messages on the other, while also signaling the RTP IP/port parameters for the voice user plane. Integration with a softBBX like Asterisk or Yate is a snap.